Hey everyone, Iâ€™m Bion! My sponsors at Ripleyâ€™s Aquariums allowed me to participate in the Tour de Turtles race this year, and Iâ€™m so excited to stretch out my flippers and win this thing! I am swimming to raise awareness about the threat of beach erosion. Believe It Or Not, 80 to 90 percent of Americaâ€™s sandy coastlines have been eroding for decades, according to the Environmental Protection Agency. 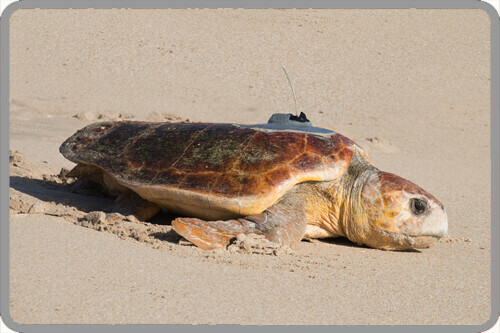 This is bad news for sea turtles, because the only place we can lay our eggs is on sandy beaches, so we all need to work together to make sure I can keep nesting on Floridaâ€™s beaches well into the future. Because sea level rise is contributing to beach erosion, you can help by limiting emissions where you can, such as biking to work or carpooling, and electing leaders who will address climate change. You can also plant native dune vegetation on beaches, promote coastal construction set-back policies and not build structures on the beach. I was named by my Sponsor, Ripley's Aquariums. Check out my marathon migration map, where you can follow along as I swim to raise awarness about the threat of Beach Erosion to sea turtles. Please help me raise awareness about my cause by supporting me!